Would you like to add blooms to your home during the winter months? Amaryllis is the answer! The bloom size is only one of the attributes that makes this bulb so very remarkable. Amaryllis are extremely easy to grow, and, there is a color and form to suit any decor. Amaryllis bulbs are available in most Garden Centers sometime around fall. It’s helpful to know that larger bulbs do make a difference. The 20-24 cm bulbs will often produce two stalks per bulb. A 28 cm bulb will always produce two stems, and sometimes three! Each stalk can be adorned with 2-5 flowers, and with that, you can understand why the amaryllis is the most popular indoor bloom! 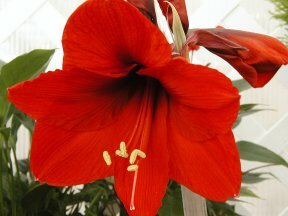 To grow an Amaryllis in your home place the bulb in a container that is a few inches wider than the bulb. 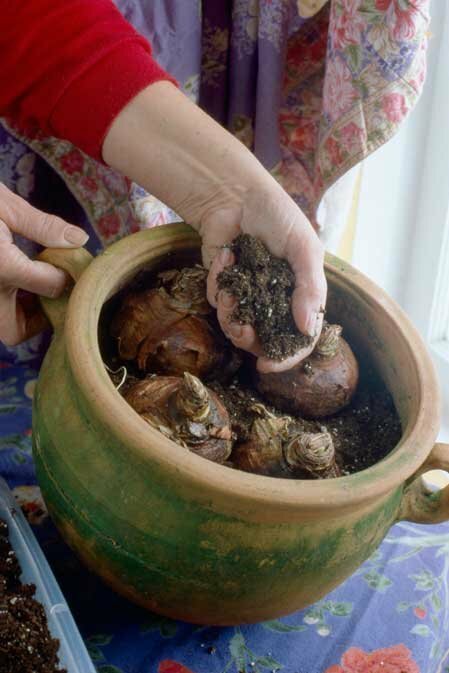 Fill with soil, leaving approximately a quarter of the top of the bulb exposed. Water, and place in a sunny location. You can also grow the bulbs in decorative gravel and water. After a few weeks a long stalk will emerge from the bulb, and soon after, a beautiful flower will bloom! Make sure to support the bloom, with stakes whenever possible. Make sure to water when dry, and keep away from heat sources so that the flower can flourish longer. Once flowering finishes, cut off the stalk, but leave the foliage. This will help reinvigorate the bulb so you’ll have plenty of blooms next year! During non-bloom times, treat Amaryllis like an ordinary houseplant. Mid- October, cut back the foliage, put in a dark place, and stop watering. About a month later, bring it out, begin watering, put it in a sunny area, and presto! More blooms!